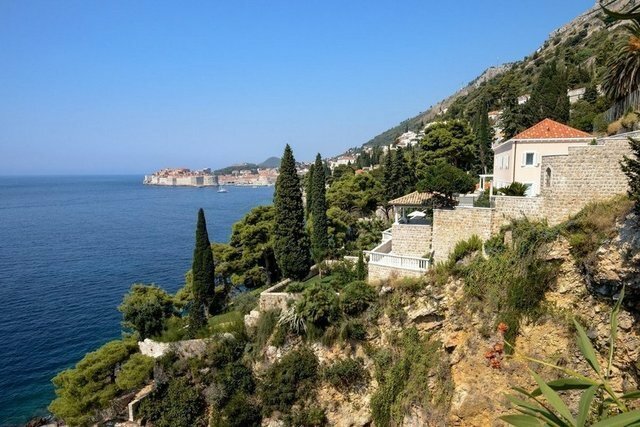 Villa Paraiso Mediterraneo is a unique holiday property that overlooks the charming Old Town of Dubrovnik and offers uninterrupted ocean views allowing you to fully relax captivated by the magical ambiance that cannot leave you indifferent. Secluded amongst the rocky cliffs, villa Paraiso Mediterraneo is a true Mediterranean oasis of peace and tranquility which takes your breath away with its elegant architecture. The refined exterior and contemporary interior of the villa perfectly blend in with carefully chosen autochthonous elements that evoke the past times allowing you to fully admire the cultural heritage and natural beauties of Dubrovnik. Villa is declared as cultural heritage and provides the ideal sanctuary for an unforgettable vacation with friends or family, while the modern equipment offers utmost comfort with a decent touch of luxury. The inspiring outdoor area boasts a swimming pool and private gardens enriched by authentic plant species such as olive trees, bougainvillea, lavender, pines and palms that are stretching all the way down to a sapphire sea with direct access to the picturesque beach. For complete relaxation, at the guests' disposal are spa zone with sauna, steam room and solarium, wine cellar and sports facilities. The main building consists of a spacious living room with a large dining area, a professional kitchen and five double bedrooms with bathroom facilities. The kitchen opens on to a large terrace with barbecue area, making it ideal for summer gatherings with friends and family. The dependence features a living area including dining space and kitchen, a double bedroom and private bathroom. The dominant position of the villa and the proximity of the sea, with a magnificent view of the historic core of Dubrovnik, make this stylish villa one of the most exclusive holiday residences, while the astonishing garden area with spacious terraces enables you to enjoy impressive architecture, art, and natural beauties. The villa can accommodate a maximum of 12 + 2 people.